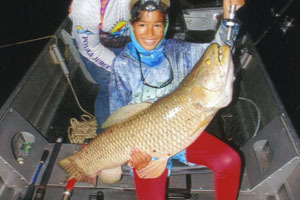 French angler Gael Commergnat - age 10 - caught and released this 13.83-kilogram (30-pounds, 8-ounce) giant trahira (Hoplias aimara) on July 24, 2018 while fishing Brazil's Rio Juruena. Commergnat needed only six minutes to land the fish, which was quickly weighed, documented and released alive. If approved, the catch will earn Commergnat the new Male-Smallfry world record, which currently stands at 10.89-kilograms (24-pounds). 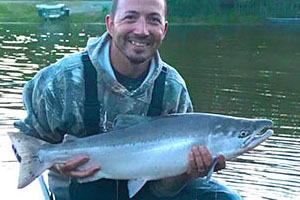 Shawn Martinez potentially set the new men's 8 kg (16 lb) line class world record for sockeye salmon (Oncorhynchus nerka) with this 6.75-kilogram (14-pound, 14-ounce) fish that he caught while fishing Alaska's Kenai River on July 5, 2018. If approved, the catch will replace the existing record of 6.57-kilograms (14-pounds, 8-ounces). 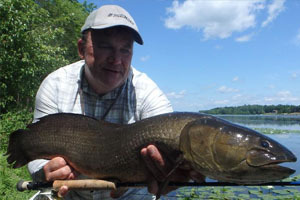 Richard Hart caught and released this impressive 82 centimeter bowfin (Amia calva) on July 29, 2018 while fly fishing on Lake Champlain, Vermont. 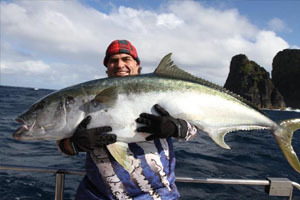 If approved, the catch will earn Hart the new All-Tackle Length world record, which currently stands at 77 centimeters.